We are looking for energetic and responsible individuals who enjoy working with players of all ages. Minimum recommended age is 18. A reasonable background in hockey is required. Coaching and / or instructing experience a definite asset. Able to communicate with young players. Ability to demonstrate and teach fundamental hockey skills. 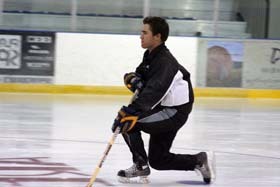 Michael is frequently on the ice with older larger players as his birthday is in late December. Every day before your camp my wife reminded him to work hard and now one of his most prized possessions is the Torjager t-shirt he was awarded. Thank you for sharing your knowledge in a fun environment, and for hiring such talented instructors to assist you. Thanks to you and your team Michael gained new skills and cherished memories. Torgager Hockey offers a variey of hockey camps in and around Calgary—designed to improve your hockey game! Private training and team training is also available. P (403) 275-3948. E wade@torjagerhockey.com. A 240-70 Shawville Blvd SE, Suite #1066 Calgary, Alberta T2Y 2Z3.